The inferior olive in the ventral medulla oblongata provides climbing fibers to Purkinje cells in the cerebellar cortex as well as collaterals to the cerebellar nuclei and thereby exerts a strong impact on cerebellar output. As a consequence, the intrinsic properties of olivary neurons and the synaptic inputs that modify their output are critical for cerebellar function. 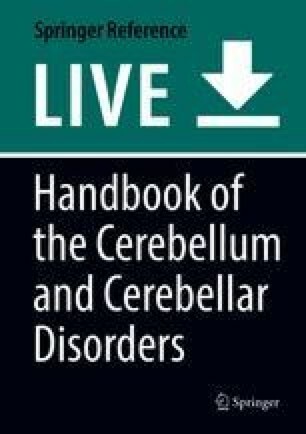 In this chapter, all major issues relevant for the ultimate function of the olivocerebellar system are addressed. First, developmental aspects including the origin and migratory routes of the cell bodies of the inferior olivary neurons are described, followed by the organization of the olivary neurons into subnuclei, as well as the outgrowth of their axons into climbing fibers innervating Purkinje cells. Subsequently, a detailed description is provided of the ultrastructure of the olivary neuropil, which is characterized by the presence of dendrodendritic gap junctions located in glomeruli and by the ubiquitously combined excitatory and inhibitory synaptic inputs of their coupled spines. Furthermore, we describe the main electrophysiological properties of the olivary neurons, highlighting their propensity to oscillate and fire in synchrony at relatively low and stable frequencies. Finally, we review the most recent cellular and network models of the inferior olive, which indicate that this unique nucleus is well designed to control patterns of both rate coding and spatiotemporal coding, albeit for short durations. As a consequence, the abnormalities in their firing properties can contribute to syndromes such as tremor, palatomyoclonus, dystonia, ataxia, respiratory deficits, and possibly also autism.